Receipts were 1395, including 319 packer cows, bred cows and pairs, 1076 yearlings and calves. Packer cows were $5 to $7 lower. Packer bulls were $4 to $6 lower. Market on bred cows and pairs were $100 to $150 lower. Market on steers and heifers weighing 500# and under were $10 to $15 lower. 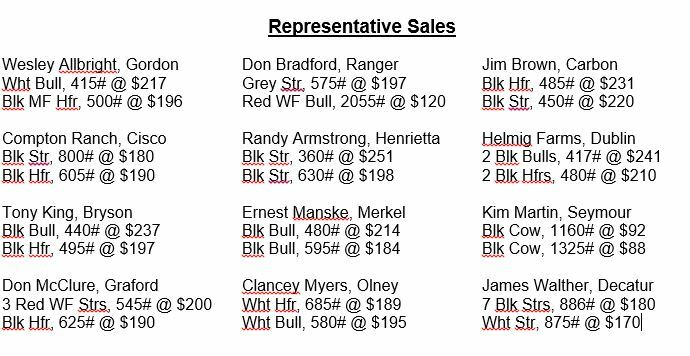 Feeder steers, bulls and heifers weighing over 500# $8 to $12 lower. The market was lower on all classes of cattle. Receipts were 1070, including 174 packer cows, bred cows and pairs, 896 yearlings and calves. Packer cows were $6 to $10 lower. Packer bulls were $4 to $6 lower. Market on bred cows and pairs were steady on the better quality cows. Market on steers and heifers weighing 500# and under were steady. Feeder steers, bulls and heifers weighing over 500# were steady. The market was steady on the calves & yearlings even though the board was down every day last week. Receipts were 2134, including 380 packer cows, bred cows and pairs, 1754 yearlings and calves. Packer cows were $3 to $5 lower. Packer bulls were $4 to $6 lower. Market on bred cows and pairs were steady. Market on steers and heifers weighing 500# and under were $5 to $10 lower. 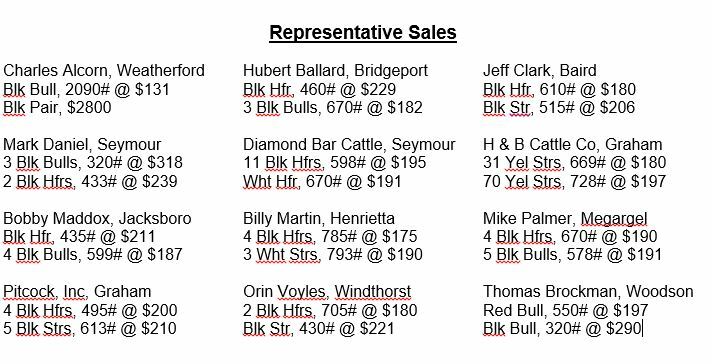 Feeder steers, bulls and heifers weighing over 500# were $5 to $7 lower. The market was lower on all classes of cattle. We need a rain!